Big gun. 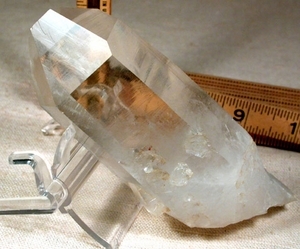 Read-through tabular Arkansas crystal is 1 1/4x 2x 5 3/4" tall, 14.8 ounces, 8 faces and extremely rare, one's a tiny diamond window. Plus a very rare 6-edged shield main face. 4 intact penetrators, 6 growth craters with two little red clay inclusions. Myriad record keepers, one fleabite, one small edge graze. Devic veils undulate up from softer veils at the base. Foils and vivid rainbows. Rare for quality and size alone.